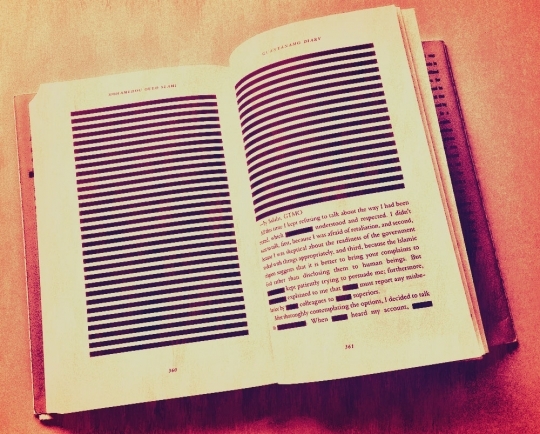 On redaction as art and Guantánamo Diary. Guantánamo Diary is a hard book to write about. It was a hard book to read, honestly. Not because the language is difficult. It isn’t. Not because it’s poorly written. It isn’t. Not even because numerous words and sentences and sometimes entire pages are elided; that takes some getting used to, but eventually creates an intriguing literary effect. Except, right, that’s the problem. 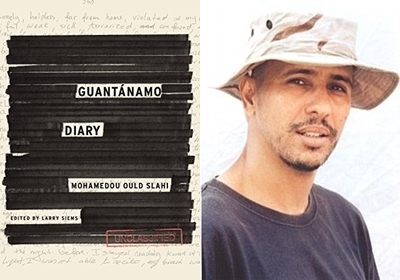 The book Guantánamo Diary by Mohamedou Ould Slahi presumably has no words blacked out. He doesn’t seem like the type to employ coy deletions for literary oomph. But you can’t read his book. Part of why Guantánamo Diary seems tricky to write about is that it’s a killer piece of nonfiction composed in an unintentional collaboration between Mohamedou Ould Slahi, who I’d venture to say is pretty clearly a good writer, even though I’ve never read anything strictly by him, Larry Siems, whom Slahi asked to edit the text, and some number of anonymous employees of the United States government, who heavily redacted the text. The thing is, those redactions seem like an important component of the currently-published book Guantánamo Diary. For instance, near the end of the work Slahi decided to include a poem that he had written. And this passage reads, “One of my poems went,” followed by one and a half pages in which every single word was blanked out. A reader is left to imagine what his poem might be, which is in some ways more powerful than having the chance to read it; every blacked out line hammers you again with the realization, he is still there. Now, it’s possible that his “poem” was simply a list of his interrogators’ names. Or that it employed metaphorical language that U.S. censers worried might be a coded message to Islamic terrorists, still dangerous despite the intervening decade and a half incarceration. Maybe his poem really was a coded threat. Or maybe, and this is the explanation I personally think is most likely, the U.S. is downright buffoonish in its malignant treatment of the man. Because it’s not as though other redactions in the book were intelligently applied. For instance, in passages about certain interrogators, pronouns are routinely blacked out, presumably to obscure the words “she” or “her.” The public must not learn that there were female interrogators! Except, the censers missed a few, so the words “she” and “her” do appear, albeit rarely, in the text. And even if the U.S. censers had successfully blotted out every instance of “she” or “her,” they left in the words “he” and “him.” Why wouldn’t a reader assume that every elided pronoun was feminine? And as a final salvo, I’d like to quote a passage where all three parties’ contributions merge together beautifully as art. Honestly, the following passage would be stunning in a work of fiction; that this is real, that my government actually did this, puts it over the top. Main text by Slahi, footnote by Siems, redaction courtesy of the United States. “How you been?” said one of the Puerto Rican escorting guards in his weak English. “No worry, you gonna back to your family,” he said. When he said that I couldn’t help breaking in ||||||||||||||||||||. * Lately, I’d become so vulnerable. What was wrong with me? Just one soothing word in this ocean of agony was enough to make me cry. On a global wealth tax, automation, and human trafficking.